Domestic migration is a customary feature of almost every country on the globe and the USA is not an exception. People leave one state and relocate to another and there are different reasons for that. One of the top states that has been losing a great number of its residents for many years already is California. You may wonder who can wish to live a sunny paradise located on the ocean coast. Other people may contradict that the information about a people loss is a mistake as the state population does not decrease, it continues growing. It is the absolute truth as the number of local people who left the state is compensated by immigration from other countries and other states. It was estimated that between 2007 and 2016 over 6 million Californians have left the state and only 5 million arrived in it. It means that a decrease of the state population by 2.5% happened there. So, where do they head for? Nevada is among top 5 states for relocation. You may wonder why move to Nevada, but the main things that make people escape from California are high taxes and cost of homes. Obviously, they find an absolutely different situation in Nevada but it is not a comprehensive list of reasons. In fact, Nevada has accepted over 45,000 of people from the Sunshine State in 2016. The most popular destination is undoubtedly Las Vegas and according to the Applied Analysis report, 34% of newcomers here are from CA. One more evidence has been provided by data of house search at Redfin.com, 75% of people who look for homes in Reno are Californians. Today, it becomes natural for Silicon Valley locals to prefer moving to Nevada to avoid California taxes and afford much more for the same money. That is why let’s consider all the benefits and drawbacks of such a relocation in details. The list of reasons that make people leave a beautiful coastline of California and move to Nevada must be rather convincing. The Sunshine State attracts millions of people from different countries annually and many of them decided to stay there forever. What then makes local Californians exchange their motherland for Nevada? Let’s look at the main reasons. Unlike California, Nevada has a more appealing system of taxes for its residents. Californians can forget about a state income tax they had to pay as well as pay less for food and medicine because there is no sale tax on these goods too. Despite a widely known fact that in Nevada you can work only in a casino, hotel or restaurant, in fact, the modern job market is more extended. Nowadays, the most popular job spheres are mining, construction, and education. Moreover, according to the data of the US Labour Department, in 2017 Nevada had a top employment growth rate all over the country – 3.3%. The highest number of jobs were offered in business services, health care, and transportation. Nevada is a home to the most eye-catching scenery in the country. Its main feature is the diversity of landscape and a possibility to experience all 4 seasons in the state. The southern part is hot and partly covered with a dessert, in the center you can find a magnificent canyon, mountainous areas, and deep lakes and rivers. There are unforgettable caves, state parks, relaxing beaches, and peaceful valleys to meet the expectations of every traveler. Despite the fact that the cost of living in Nevada is 4% higher than the US average one, it is still much more affordable than in California. Here you can save on utilities that are much cheaper as well as obtain a dwelling that is thrice cheaper than in the Sunshine State. A median home price even in Las Vegas, the most expensive city to live in Nevada, is only $256,300. In Los Angeles, the sum is almost three times higher – over $600,000. Who does not know that Las Vegas is a gambling capital not only of the US but also the whole world? Every person dreams at least once in his life waste a huge sum of money there and win a fortune. It is absolutely legal to gamble here not only in casinos but also in many other places – slot machines are almost everywhere there. You will not feel dull in the state not only due to unforgettable gambling experience and many outdoor activities but also doing premium shopping, tasting delicious food or visiting multiple concerts, shows, sports events that take place both in Las Vegas and Reno. However, there are several more things you need to know before moving to Nevada apart from the benefits. Unfortunately, Education Week’s Quality Counts rankings have place Nevada education at the last place this year again. The state’s grade was D – it is lower than the average C grade all around the country. Evaluating 3 areas including success chances, school financing and K-12 achievement, each of the area has not received a grade higher than D.
Nevada is the only US state where prostitution is legal. Of course, it is heavily regulated and is allowed only in several rural counties. Of course, such information can scare many people as even after many years radiation makes its influence on people’s health and nature. However, locals refuse meeting mutated insects or animals or getting superpowers. You should still remember that a huge part of Nevada is a desert and you can feel unbearable here in summer especially. The northern part of the state often suffers from extremes making people freeze when they leave home sometimes. The total population of Nevada state is about 3 million people. 2 million people live in Las Vegas and 500,000 people live in Reno. The rest of them are scattered in several small towns. It means that the choice of places to move to is very restricted and you will feel remote there if you choose not these two cities. Whether you are moving for job or any other reason to Nevada, consider both pros and cons of such decision to avoid regrets. If you plan to change residency from California to Nevada, consider the following relocation tips. The main problem to solve when you relocate to another state is to find a trustworthy and full-service moving company. If you want to have your belongings delivered safely and according to the schedule, choose local leaders. You must also remember that this direction is rather costly mainly because of its popularity as if you needed to travel back to CA, you could pay 5 times less for relocation. Moving to a new state means that you need to apply for a driver’s license there, change car registration, get new insurance, set up your utility data, move your bank accounts, register to vote and make many other steps to feel a resident here. 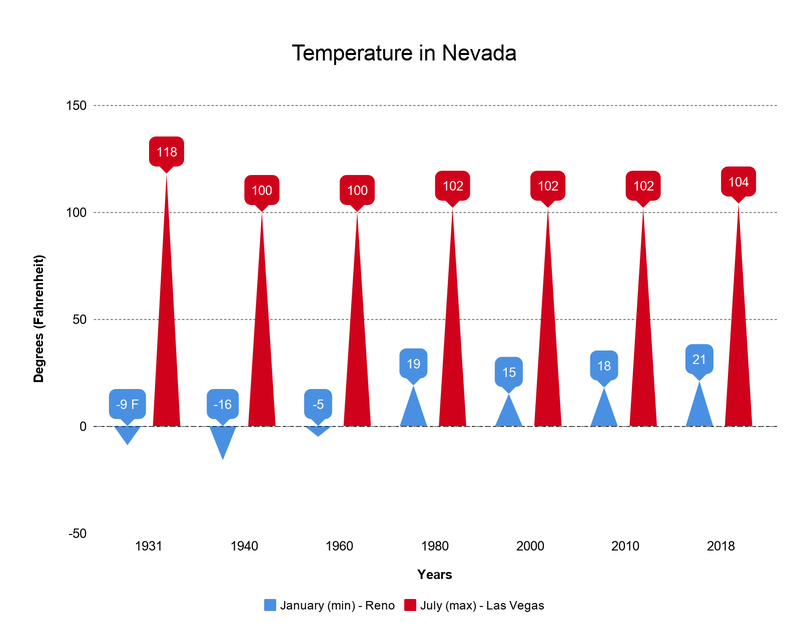 Nevada is an unpredictable state that can meet you either with a heat or frosty wind. Always check the weather forecast not to start your new lease of life with health issues. As soon as you change the address of your IRA and brokerage accounts, they will fall under Nevada laws and you will be protected from attacks from the former CA life. Unfortunately, CA laws and taxes are not so liberal as in Nevada, so it would be much better for business owners to create a new corporation in the new state. Continuation of running a business in CA will lead to a necessity to register as a foreign corporation and pay CA tax rates. If you do not want to give a huge percentage of your money to the state, you need to take advantage of one of the tricks on how to avoid a primary residence capital gain tax. It is possible to turn to IRA to claim for an exclusion on your home every two years. Declares himself to be a resident and shows the desire to use all the privileges offered to the residents of the state. It means that you can change a driver’s license, for example, only if you provide the proof of your Nevada physical address. There are many ways to do that: you can learn about them following the link dmv.org and choosing the information about Residency & Proof of Identity. It was already mentioned that you will not find a majority of cities and towns to relocate to in Nevada. That is why the list of popular destinations in this state is rather restricted. Look at the top 4 places where you will feel like at home in Nevada. Las Vegas Being not only the most populated city in Nevada, Las Vegas is the 28th most populated city in the USA – over 2 million people reside in its metropolitan area. Being a gambling capital of the world the city economy is also based on tourism and conventions as well. The cost of living here is only 3% higher than an average one around the country. 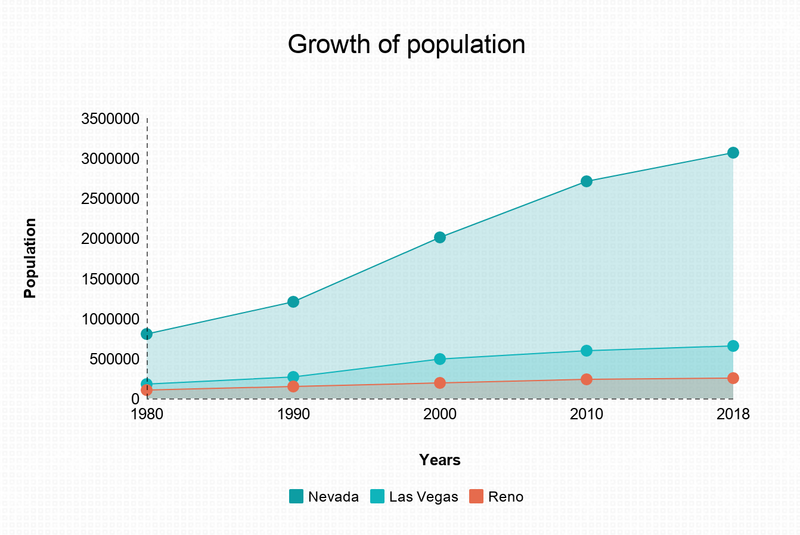 Reno It is the 4th most populated city in Nevada with over 230,000 people living there. Reno is called “The Biggest Little City in the World” and is renowned for its casinos and hotels too. It used to be a gambling capital in the 1950s, and now it is reviving its exciting history attracting gamblers with numerous events. In Reno, you will have to spend more by 7% for your customary flow of life. Elko Being “The Heart of Northeast Nevada”, Elko is the largest city in area, but there are only about 20,000 people living there. The city economy is based on gold mining predominantly, tourism and ranching take the second place. 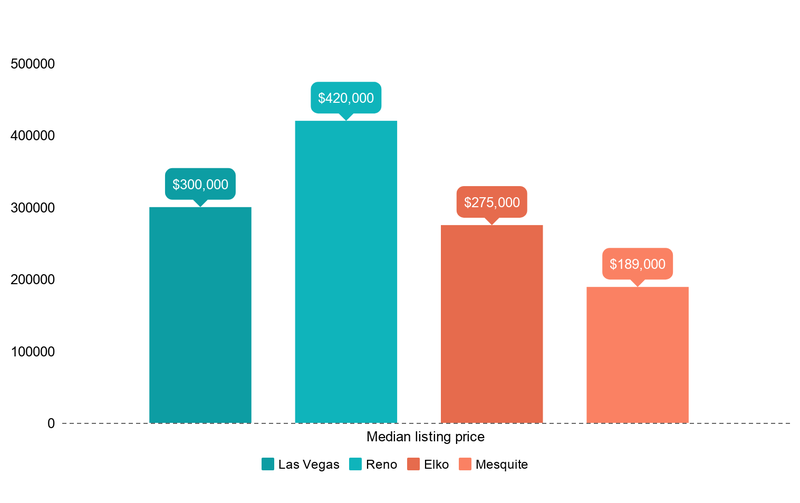 You may be surprised to hear that products cost more in Elko than in Reno, for example, but dwelling is cheaper there. Mesquite Being a city of retirement community Mesquite offers a tranquil life in the beautiful valley in the mountains. Its population is over 18,000 people only and most of them are employed in casino resorts and golf playing. The cost of living index here is 2% lower from the average one. If you are interested that all your valuables could be delivered safely and on time, turn only to the trusted leaders. It is a guarantee of the premium customer support and affordable prices. The latter ones are offered below. *Moving costs for 1bdrm apartment. Includes: Truck + gas, mileage, etc. 2 professional movers + tools. Blankets. Wardrobe Boxes. Assembly/Reassembly. Tax&Insurance. What does the median mean? So, literally “in the middle”. Or this means exactly half of homes listed are above this price and exactly half are below. For example, there are 5 homes for sale in a market at prices of $275,000, 300,000, $350,000, $450,000, and $700,000. The Median Price would be the one in the middle, or $350,000.